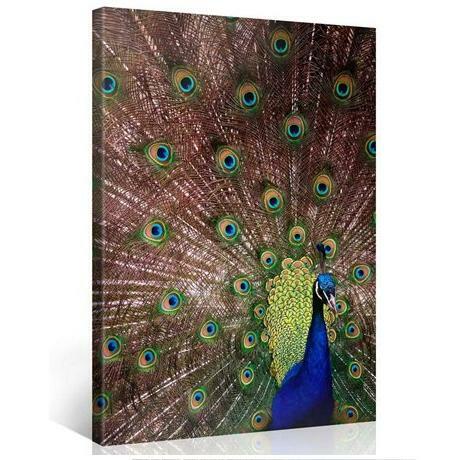 This first-class canvas Peacock print is produced using only the highest quality materials and the latest printing technology to ensure an outstanding result. To guarantee rich, vibrant, saturated colors that will not fade, smudge, bubble or crack for up to 75 years, we use special HP Latex inks. The inks are water-based, solvent-free, UV resistant and odorless thus ensuring that they are safe for the whole family. Each canvas print comes already stretched on a sturdy wooden frame by our local team in America. Our team carefully stretches each picture onto the frame and inspects each one to give you a professional, ready to hang, gallery wrapped canvas print.